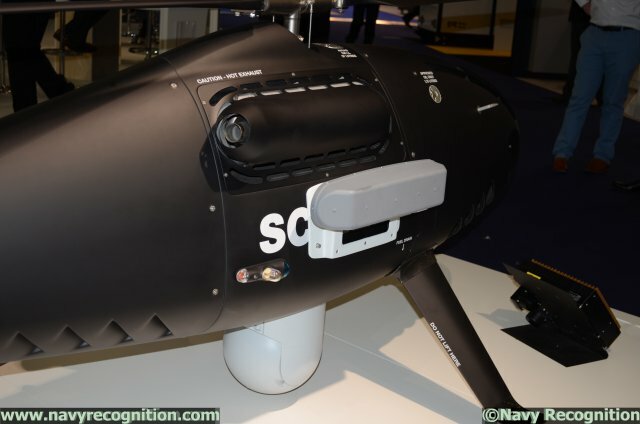 At Euronaval 2014, Austrian company Schiebel came in Paris to present an upgraded variant of its well-known Camcopter S-100 Unmanned Aerial System. 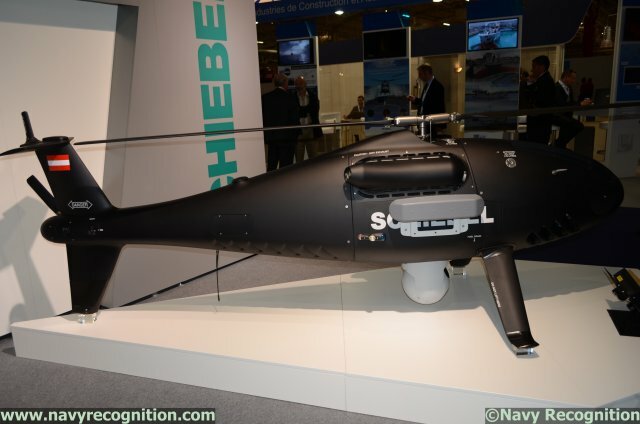 For the occasion, Schiebel chose to integrate the Selex ES SAGE advanced digital Electronic Support Measures system on its drone. Its robust design makes the Camcopter S-100 ideally suited for use in maritime operations and has been operationally proven on single-spot ships worldwide. Its compact size and light weight means the S-100 can be easily maneuvered, stowed, and maintained in ships hangars. A typical frigate-sized hangar can store up to five S-100 allongside a conventional large manned helicopter, and successfully complements operations traditionally completed by manned helicopters. It is fully marinized against corrosion through the extensive use of carbon fibre composite materials, stainless steel, titanium, anodization and special coatings. With its automatic VTOL capacity, it can take of and land unaffected by rain and strong winds on any ship with a helicopter deck. The S-100 is optionnaly equipped with a harpoon deck capture system for use with any NATO grid. Now integrated on Camcopter S-100, Selex ES' SAGE, advanced digital Electronic Support Measures (ESM), provides an unparalleled geo-location capability from a single platform. The state-of-the-art system can be fitted to multiple platforms ranging from mid-sized UAVs to large transport aircraft. Available in a variety of configurations with the option to add a Communication ESM Channel, SAGE can be tailored to your platform and your requirements. SAGE is a true ‘force-multiplier’ in that it eliminates the requirement for specialist ESM platforms, reducing cost, increasing commonality and enhancing flexibility. SAGE can passively detect, identify and characterise emitters at less than 1°rms and cue other sensors, such as SAR, or be datalinked off-board to cue other entities. The flexibility of the SAGE system enables it to be integrated onto UAVs, Helicopters, Fast Jets and Transport Aircraft. 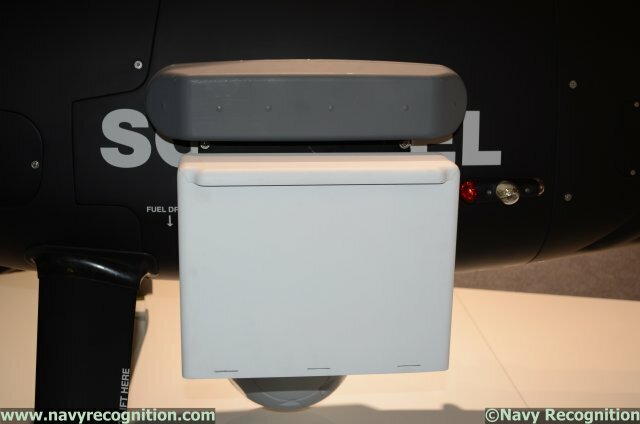 Its main application is Situational Awareness and intelligence gathering, which is optimised through wideband and channelised receivers that generate instantaneous detection and enable ELINT analysis. The SAGE system effectively performs advanced ESM, platform protection and geo-location in both military and civil applications. It is equally capable of operating in hostile complex environments, or enhancing the capabilities of Maritime Patrol Aircraft and other homeland defence platforms. The ability of SAGE to identify and categorise complex emitters, whilst recording data for further analysis gives the foundation of a true sovereign ELINT capability. In turn this will enable you to take control of your own EW databases and threat libraries whilst providing the capability to create and tailor Mission Data Files to suit sovereign needs.